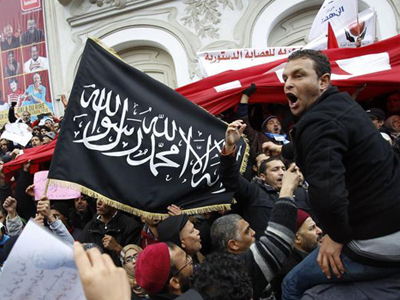 Thousands have rallied in support of Tunisia’s ruling Islamist party, shouting anti-French slogans in the country’s capital. It followed anti-government protests and the Tunisian Prime Minister’s pledge to resign if he fails to form a new cabinet. ­About six thousand people answered Ennahda party’s call to show support for the existing government and the work of the constitutional assembly. The assembly’s drafting of a new Tunisian constitution was recently interrupted by the assassination of opposition leader Chokri Belaid. It also caused a widening split in the Tunisian ruling coalition, with Prime Minister Hamadi Jebali vowing to call a new government of non-partisan technocrats to survive the crisis. His own party Ennahda rejected the move. Jebali pressed on with his plan on Saturday and said he will step down if a cabinet of independent ministers is not formed within days. The pro-government rally started less than a day after an unlikely silence befell the city following a massive funeral procession of the slain opposition leader and an accompanying protests across the country. Belaid’s funeral gathered hundreds of thousands on Friday, and saw the army deployed to provide security. 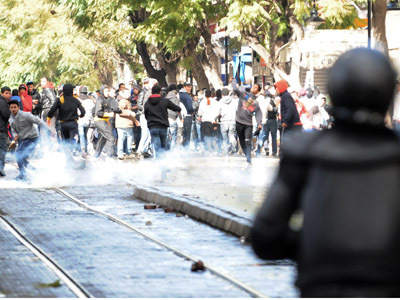 Responding to the recent unrest that threatened to unwind a new revolution in Tunisia, Ennahda leader Lotfi Zitoun, claimed the Islamists still have “the power of the street” in a speech to the demonstrators on Saturday, Reuters said. 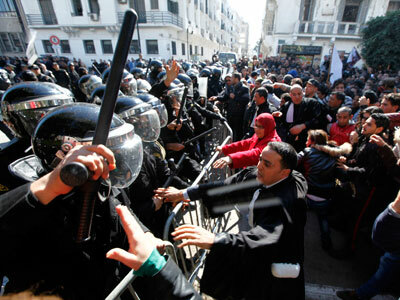 “Allah akbar,”“We are Muslims, we will not be moved,” the crowds that gathered in the center of Tunisian capital echoed. 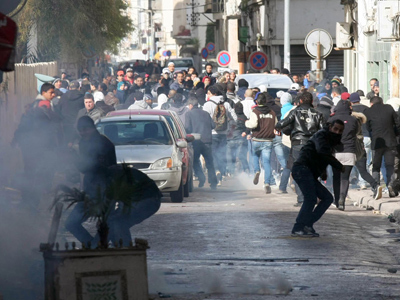 The demonstrators’ rage was also directed at the French, former rulers of colonial-times Tunisia. French Interior Minister Manuel Valls has condemned Belaid’s assassination and called it an attack on “the values of Tunisia’s Jasmine revolution.” He also warned of a rising “Islamist fascism” in Tunisia, prompting Ennahda to protest against “French interference” in the country’s internal affairs. Once the cradle of the Arab Spring revolts, Tunisia seems to have changed “beyond recognition,” as the three day violence suddenly halted and gave way to a completely different march, RT’s Maria Finoshina reported from Tunis. There was no sign of tear gas or helicopters as the supporters of Ennahda filled the city’s central avenue, which the police “did their best” to block just a day before, Finoshina said. But the new Tunisian crisis is far from over, with tensions running high in the country’s divided coalition government of Islamists and seculars. 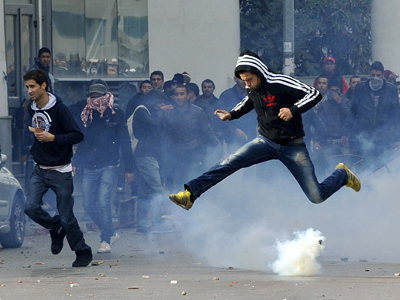 Recent threats made against the burial site Belaid have only heightened tensions. Ultra-conservative Salafi Islamists reportedly vowed to dig Belaid’s body out of a Muslim graveyard, since the Tunisian defense minister has issued a statement that promised the army will protect Belaid’s grave.